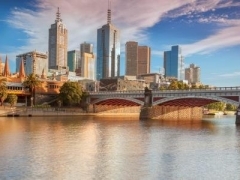 Add a splash of colour to holiday photos with today's Groupon to Melbourne, Australia. For $698 per pax, you get a 5D3N Hotel Sophia Stay with 2 Way Qantas Airways Flight and Guided Tour as per itinerary (worth $1188). Soak up the history and romance of one Australia's most iconic cities from your accommodation, Hotel Sophia, which acts as a suitable launchpad for your imminent Aussie adventures. Each room features all mod conveniences including broadband access, video on demand, air-conditioning and heating, while the comfortable bed helps you to stretch out and relax so that you awake refreshed and ready to make the most of your stay in Melbourne. In the morning, indulge in a full breakfast before embarking on a memorable adventure to Mt Buller and Phillip Island. In the evening, wind down at The Golden Age which enjoys a colourful 106 year tradition of service at this site. Despite its newly renovated modern surrounds, the distinctive old world charm still permeates through the bar's on-tap and bottled beers, wines, spirits and coffee, not to mention their hearty Greek-style menu at affordable prices. Merrymakers will be guided along the Great Ocean Road, a positively breath-taking coastline too spectacular to be done justice via camera lenses, which has earned its title as an Australian National Heritage. A far cry from the densely populated, cramped city life we are all used to, this sprawling highway will grant some much-needed respite from the pollution amidst greenery, sapphire-blue waters and vast horizons. Phillip Island urges visitors to come hither with its astounding array of wildlife, including Australia’s largest fur seal colony, the little penguins and cuddly koalas. Located only 90 minutes from Melbourne, the island features spectacular coastal scenery, charming heritage and an abundance of friendly wildlife. Get up close and personal with koalas and kangaroos frolicking about in their natural habitats before joining the penguins at dusk as they emerge from the surf, fresh from a brief sojourn and hang sesh. After all that sightseeing, shopping seems almost mandatory. Fortunately, Melbourne is not short of fabulous shopping haunts. Just few minutes away from Hotel Sophia is Queen Victoria Market. A must-visit no matter what your aim is in Melbourne, this swap market has everything from inexpensive souvenirs to Alpaca sweaters. If the market is still not enough to please your shopping desires, make your way to Melbourne Central where you can browse through book stores, buy Australian opals, have a nice cup of coffee, or fill your suitcase to the bursting point.